Do you peel lemons before tossing them into your morning smoothie? How about beets, cucumbers, or kiwis? The peelings provide added nutrition; no reason to toss them out. I’m also a big fan of fiber, so I don’t peel most fruits or veggies. Plus, my personal entourage of microbial critters, the hundreds of thousands of bacterial species (gut flora, AKA microbiome) that call me home, thrive on this diet as well. Yes, my body is a temple, complete with a bazillion little symbiotic worshipers. At least that’s the idea. We need a healthy, diverse, and thriving microbiome as part of our internal ecology. That helps keep the immune system strong, autoimmunity in check, and may reduce the risk of some forms of cancer, especially those associated with the GI tract. We’re bombarded today with chemicals our grandparents weren’t exposed to. Many of these toxic substances (pro-carcinogens) become genotoxic (mess up our DNA) upon metabolic activation by our gut bacteria. Our world is toxic. We eat, drink, breath, and expose ourselves to harmful substances on a daily basis, many of which are in our food supply. Research indicates that a large percentage of known carcinogens require enzymatic activity to trigger malignancy. The bacterial composition of the gut microbiome (good bugs vs bad bugs) and the metabolic byproducts from all those critters can either protect us or do us in. The idea is to encourage the good bugs to flourish. It’s also important to keep things moving along, if you know what I mean. A plant-based, high-fiber diet not only provides nourishment for our friendly bacteria, it also helps fight disease and prevents us from being full of poo. The role of the gut microbiome is a hot research topic these days, and although the findings are intriguing, they can also be confusing. Or weird, especially when you throw cootie genomics into the mix. It’s not just our DNA floating around in the gene pool, it’s also the genetic elements of our personal collection of microbes. We’re one big complex ecosystem. Hopefully our microbiome is living in harmony with the rest of us. Food choices, pre- and pro-biotics, and how much fiber we consume can shift the bacterial composition to either enhance our well-being or encourage disease. Here are a few details. Microbiome: the interaction of all the microscopic organisms, including their genomes, in one specific environment. * In this post, I’m focused on the human gut microbiome. If you’re interested in the skin microbiome and you’re not germaphobic, check out this article on women’s flat track roller derby in which the skin microbiome of individual contestants was analyzed and matched to team membership. Each team had its own specific microbe community. Not only did they have team colors and team mascots, they had team cooties. Very cool. And weird. Prebiotics: Nondigestible food ingredients (fiber) that encourage the growth of beneficial bacteria. Prebiotics are food for microbes. Feed your microbes well. * Gluten-free sources of foods containing prebiotic fiber include Jerusalem artichoke, jicama, asparagus, banana, dandelion greens, onions, leeks, garlic, raw oats (make sure they’re certified gluten-free), chicory root, and yacon. Unrefined wheat and barley are also good sources, but those foods are off limits for those of us with gluten intolerance. Probiotics: live microbes that provide health benefits to the host (you) by augmenting beneficial intestinal bacteria. * Probiotics can be found in supplement form. I don’t take supplements, so I try to get my dose of probiotics from fermented foods like miso, sauerkraut, yogurt, and kefir. Fiber: The nonstarch polysaccharides found in plant foods that are not broken down by human digestive enzymes, although some (prebiotics) are digested by GI tract bacteria. Fiber is often categorized as soluble or insoluble. Insoluble fibers are called “bulking agents.” They help keep us regular (poo-wise). This is the fiber most people refer to when they talk about constipation. It literally sweeps out the GI tract, which is a good thing. Remember the Elvis story? Soluble fiber helps that process, but it also has therapeutic effects. Soluble fiber delays the absorption of glucose (insulin response), helps us feel full, and decreases cholesterol levels. There’s even research suggesting soluble fiber may help reduce blood pressure and improve the absorption of minerals. That last part is especially interesting. Some people avoid grains and legumes because of the phytic acid (phytate) content. Phytic acid isn’t classified as fiber, but is common in fiber-rich foods. It’s a non-nutrient, found in the husk of grains, legumes, and seeds. It can bind with certain minerals (zinc, iron, calcium, magnesium) and decrease their absorption. But — researchers have also demonstrated that rats absorb more calcium, iron, and magnesium when fed a diet rich in soluble fiber, which is found in those same plants. We’re not rats, but these are interesting findings. Another article suggested that when soluble fiber ferments in the colon, it enhances the absorption of minerals. We eat the plants that contain both phytic acid and soluble fiber and what happens? Beats me, I’m not a biochemist, but the type of fiber appears to be important when it comes to mineral absorption. Soluble fiber that promotes intestinal fermentation and an increase in beneficial bacteria has a positive effect on mineral bioavailability. It’s a convoluted puzzle with lots of variables and depending on what you want to prove, you could cherry-pick data from either side to make your case. Having said that, I’m not convinced phytic acid is anything to worry about, especially if your diet is based on whole foods (lots of plants) rich in micronutrients and fiber. Soluble fiber in the form of prebiotics is the stuff our gut microbes call dinner. The names don’t really matter, but if you’re interested — inulin, fructooligosaccharides (FOS), arabinooligosaccharides (AOS), and to some degree, pectin, are soluble fibers with prebiotic properties. As mentioned above, they help increase good bacteria at the expense of bad bacteria. Here’s where it gets even more interesting. You’re fascinated by all this, right? You’ve probably heard of leaky gut (intestinal permeability), especially if you have celiac disease, gluten sensitivity, Crohn’s disease, IBS, or any other autoimmune or GI related condition. We don’t know all the causes of leaky gut, but one thing is clear. The “Standard American Diet” (processed food, low fiber, high animal product diet) compromises food transit and waste elimination. In other words, if stuff doesn’t move along at the right speed, you end with a bumper-to-bumper traffic jam. When that happens, it alters nutrient availability to good gut bacteria and stimulates an overgrowth of bad gut bacteria. The bad bugs start partying, produce icky byproducts, and our intestinal cells take a beating. That abnormal balance alters gut permeability and allows funky stuff to slip through the cracks and be absorbed into the bloodstream. Security is breached, alarms go off, and every system in the body becomes a potential target for invaders (antigens). Antigens are substances that invoke an antibody response, but sometimes our antibodies, which are produced to protect us, get confused and target our own tissues (autoimmunity). Does that sound familiar? Who’s had antibody testing for this or that? Here’s how it all ties together. 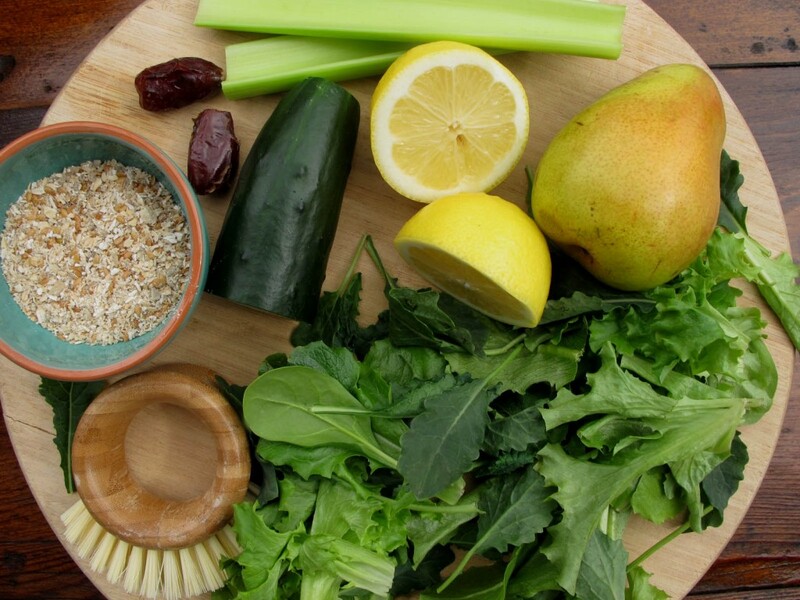 See the smoothie ingredients pictured above? They include a mixture of fiber types, along with a rich assortment of nutrients, including vitamins, minerals, antioxidants, and phytochemicals. The American Dietetic Association’s daily recommendation for fiber is 25 grams for women and 38 grams for men. After age 50, the ADA recommendations drop to 21 grams for women and 30 grams for men. YIKES, in my opinion, that’s way short of what we should be consuming. I’m over 50 and that smoothie of mine alone contains close to 17 grams of fiber. I’m almost at my daily recommendation before 6 AM. Twenty-one grams is not enough to encourage and support a healthy gut microbiome. Not even close. Recent archeological findings suggest that at least a few of our hunter-forager ancestors consumed up to 135 grams of prebiotic fiber per day. Whoa, I’d call that high-carb, optimal foraging. Not exactly most modern day versions of the Paleo diet. Although 135 grams of fiber per day is a bit much (don’t try that at home, you’ll explode), American’s are definitely short-changing themselves when it comes to fiber — and overall health. In a nutshell. Eat more plants. * Use organic vegetables and fruit, especially if you’re eating the peels. Scrub the peels well before using (see my little veggie scrubber shown above). Options: I also use raw beets, jicama, burdock root, broccoli stalks, asparagus, bananas, berries, and whatever else I can think of in my smoothies. Place all ingredients in a high-powered blender (VitaMix, Blendtec, etc.) and blend until smooth. * Retaining the lemon peel doubles the fiber and significantly increases the vitamin C. The peel also contains a phytochemical called d-limonene, a component of the essential oil in citrus. Studies show this substance is chemopreventive and chemotherapeutic, meaning it helps fight against cancer. * I always add a source of protein to smoothies. Hemp, chia, various nuts and seeds, or raw oats are favorites of mine. Raw oats provide carbohydrate, but the kind I use are also high in protein, iron, and soluble fiber, which in turn provides prebiotic fuel for beneficial microorganisms like bifidobacteria. If you’re worried about phytic acid, some oats have no hull, lessening the content. At least that’s my assumption, although I couldn’t find any research to back this up. My Understanding Normal and Clinical Nutrition book defines phytic acid as: a non-nutrient component of plant seeds; also called phytate. Phytic acid occurs in the husks of grains, legumes, and seeds and is capable of binding minerals such as zinc, iron, calcium, magnesium, and cooper in insoluble complexes in the intestine, which the body excretes. If phytic acid is found in the husk and there is no husk, it makes sense that there’s less (none?) phytic acid in hull-less oats. I get my certified gluten-free, high protein, hull-less oats from Montana Gluten-Free Processors or Gluten-Free Prairie. Some people with celiac disease don’t do well with oats, even gluten-free oats, so ask your healthcare provider if oats are a good choice for you. For a little background and a list of what good bacteria do for human health, check out this past post of mine (How much of you is really you?). Check this post for some plant magic, (Talking bacteria and disease-fighting veggies). I signed up for the American Gut Project to determine my gut microbial makeup. It will be interesting to see how those of us with celiac disease compare to the rest of the participants. I’ll keep you posted. If you want to know what you’re made of, check out the open source, community driven effort to characterize the microbial diversity of the American (and global) gut. Let’s compare bugs! Peace, love and gut checks! Chadwich RW, George SE, Claxton ID (1992) “Role of the gastrointestinal mucosa and microflora in the bioactivation of dietary and environmental mutagens or carinogens.” Drug Metabolism Reviews. Vol 24, Issue 4, 425-492. Crowell P. (1999) “Prevention and Therapy of Cancer by Dietary Monoterpenes.” Journal of Nutrition. Vol 129, No 3, 775-778. Whitney EN, Cataldo CB, Rolfes SR. Understanding Normal and Clinical Nutrition. Wadsworth/Thomson Learning. Belmont, CA. 2002. This entry was posted on Tuesday, March 26th, 2013 at 10:48 am	and is filed under Artful Aging, Celiac & Gluten Intolerance, Nutrition Therapy. You can follow any responses to this entry through the RSS 2.0 feed. You can leave a response, or trackback from your own site. What would I do without you?! Seriously, you’re one geeky girl I can count on to at least read my ramblings. Thank you, thank you. Yes, I’m passionate about all this and I appreciate you noticing and not bailing out on me. =) This post took way more time than I wanted, but one thing led to another and I found so much interesting research that I just couldn’t let it go. But you’re right, I do feel lighter after dumping all this into a blog post. Thank you, my nerdy friend. You always have such interesting, educational posts! And I’m envious of that little veggie brush. Thank you for sharing all of this valuable info! you had me at “gut bugs”. Love it!!! I am all about keeping the gut healthy. Fermented foods are so good for that. Great article. Definitely going to share this one. And I want that veggie brush….. This was a most fascinating read! I’ve just completed a monthlong Digestive Intensive with Andrea Nakayama, and this just dovetails beautifully with what I learned. I am registering myself for your geek club:). I will admit to having a hard time with putting the peel of a lemon in my smoothies – I get heartburn from it. So, do you have a preference for the hull-less oats? I’ve been using either Bob’s Red Mill or Trader Joe’s. Keep up the great work. I love reading your posts and so appreciate the time you put into teaching us. And I, too, covet the brush:). Thanks so much for the comment and update on what you’re doing. Sounds awesome. I took a semester of Digestion & Detox when I got my nutrition degree. I love that stuff (the ins and outs of food). Hmm? Interesting about the lemon peel and heartburn. That’s too bad as there are some awesome nutrients in lemon peel. We don’t have a Trader Joe’s here (darn), but all my oats come from the MT farmers. I know how careful they are and I just don’t trust too many other companies. These guys do a good job. Check the link in my post. It will bring you to their website. Gosh, that veggie brush is popular. I must admit, I love it. Sorry I am so late reading your last 2 posts. I was on a much-needed vacation and I actually fulfilled a “bucket list” dream. I swam with dolphins in Key Largo (me, the sick lady who could not tie her own shoes or climb stairs just 2 years ago. so, whoohoo! )… but I digress. Yaaay!! Add me to the appreciative geek squad that “gets” why good guy bugs are essential. (I had stool testing done around the time of my DX and it showed an absence of “detectable” growth of good bacteria. That’s almost impossible they told me.) I had to high dose probiotics to right the leaky ship that was my GI tract. A lifetime of crazy bowel issues have turned around! Normal feels…well, normal. We make our own sauerkraut and I do enjoy smoothies with plain yogurt. I am a high fiber girl all the way. Before DX, I did not eat nearly as many veggies as I do now (a mixed blessing?) and this smoothie looks like a really great way to get more good guys on board. Thanks!!! As always, I appreciate your wonderful insight, your research, your humor and your desire to share your wisdom with the rest of us. As always, I love hearing from you. I’m thrilled you swam with the dolphins. What an amazing experience that must have been — and healing. Isn’t it incredible that food can make such a profound difference in your health? One way or another. It’s wonderful that you’re on the healing path. It’s definitely a roller coaster ride, but I guess that’s what life is all about (the ups and the downs). Funny, with all the cooking and food prep I do (I rarely eat out), I’ve never made my own sauerkraut. That’s on my kitchen “bucket list.” Now you’ve inspired me! Thank you, thank you (for a variety of reasons). I did not eat out (except at my friend’s dedicated GF bakery/cafe) during the first 2 years post- Dx. The past few months, I have been more courageous while going to NYC and traveling to Florida. The “Find Me Gluten Free” website is a fantastic resource. I have been posting all the places I dared to eat in and I recommend only those that did not make me sick. Home cooked is always best, but sometimes, it is good to know we can go out and enjoy. I just love your articles so much. More, more please! !